Reviewing a compilation obviously involves a rather different process than reviewing an album of completely new material. My readers will forgive me if this write-up is not as detailed as my reviews usually are, and, for instance, does not include information on all the musicians featured on every track. In this particular case, the compilation is a 2-CD package, comprising a total of 36 tracks spanning almost 20 years of the career of one of the most interesting artists on the current music scene – Texas-born touch guitarist, composer and multimedia storyteller Trey Gunn, known to the majority of prog fans for his 10-year stint in King Crimson. I have to admit to having been for quite a long time largely unfamiliar with Gunn’s musical output outside Fripp’s legendary band and a handful of scattered tracks from some of his solo projects. However, two years ago I had the opportunity to see him perform live as a guest of Eddie Jobson’s UKZ project, and was highly impressed by his skills and warm stage personality. Later, I found out that he was born exactly two days before me – perhaps not very relevant from a musical point of view, but an interesting bit of trivia nonetheless. Released in November 2010, I’ll Tell What I Saw is jam-packed with extremely stimulating music taken from the numerous albums recorded by Gunn in the years from 1993 to the present day, both in his own name or with various other projects featuring international artists. Running at over 2 hours, it manages to sustain a consistently high level of quality, with hardly any filler at all, offering a heady mix of musical styles interpreted with flair, skill and soul. 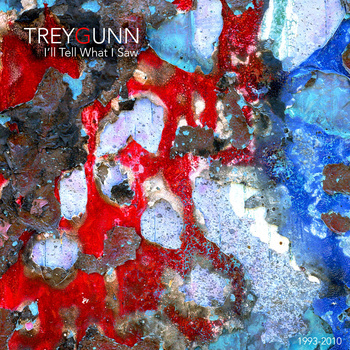 Indeed, Trey Gunn’s output might easily be held up as an example of a genuinely progressive approach to music-making, open-minded and eclectic, always looking for new sources of inspiration, and never letting his creative impulse grow stale. The oldest items included in the compilation date back from Gunn’s debut album One Thousand Years (released in 1993), and (perhaps unsurprisingly) reveal a strong King Crimson influence, with “Kuma” in particular sounding like something out of the magnificent Discipline. As a matter of fact, the Crimsonian vibe can be heard in all of Gunn’s Nineties material, as witnessed by “Hard Winds”, another track characterized by the insistent, interlocking guitar lines and heavy yet intricate drumming typical of Fripp’s crew in their Eighties and Nineties incarnations. Gunn’s two more recent projects involving drummers – TU with fellow KC alum Pat Mastelotto, and Modulator with German-born wunderkind Marco Minnemann (who was also part of Eddie Jobson’s band when I saw them in 2009) – spotlight the marriage between the drums and the stunning versatility of Gunn’s trademark Warr guitar, with dramatic, mesmerizing textures and plenty of driving energy. However, while the TU tracks are more structured, the Modulator stuff (originally conceived as a 51-minute guitar solo) is largely improvisational in nature. Some of these numbers, especially the thunderous “Untamed Chicken”, seem to emphasize the drum-driven heaviness that characterizes compositions like “Level Five” (from King Crimson’s 2003 album The Power to Believe). Italian outfit N.Y.X.’s “Down in the Shadows” carries nuances of ‘alternative prog’ in the dark, industrial-tinged style perfected by Tool; while the bass-powered “Arrakis”, recorded live in 2001, foreshadows the avant-fusion of contemporary bands such as Zevious. On the other hand, Gunn’s collaboration with Russian singer Inna Zhelennaya on her 2009 album Cocoon and on the eponymous 2005 album by The Farlanders explore the fascinating reaches of world music, injecting a welcome dose of thoroughly un-cheesy melody (also evidenced in gorgeous opening “Hymn”) in the proceedings. Zhelennaya’s hauntingly keening Russian-language vocals, somehow reminiscent of Lisa Gerrard’s otherworldly chanting, blend uncannily well with Gunn’s quicksilver guitar, producing some very distinctive results in the likes of the hypnotic “Maslenitsa” (the longest track on the album at almost 10 minutes, and possibly its highlight), “Well” and “Drunk”. Entrancing ambient tones, coloured with a feel of gentle melancholy, surface in Gunn’s collaboration with Russian clarinetist Sergey Klevezny; while the slow, liquid “9:47 PM Eastern Time” brings to mind KC’s “The Sheltering Sky”. KTU’s accordion-laden ”Jacaranda” and the Middle Eastern-flavoured “The Magnificent Jinn” branch further out in world music territory, though combining those ethnic influences with the angular dynamics typical of King Crimson. As exciting and eclectic as I’ll Tell What I Saw is, I would not recommend listening to the whole 2-CD set in one take, since music this challenging and edgy might induce a sense of sonic overload, especially in those listeners who are used to more conventionally structured fare. Thankfully, there is enough diversity within those 36 tracks to keep the most demanding listeners happy. It is, however, music with a high level of complexity, even in the case of the shorter compositions, and needs to be approached with the right attitude. All in all, this is an excellent summary of Trey Gunn’s adventurous, ever-changing career, and an outstanding introduction to the work of one of the most intriguing purveyors of genuinely progressive music on the current scene. Great review of an amazing double CD!